When most people think of Las Vegas fabulous casinos, Lady Luck, and unforgettable evening shows immediately pop into their heads. And if you’re a golfer, well, images of ‘big game hunting’ courses also crowd the mind. On several occasions I’ve visited Las Vegas and played my share of its many fine courses. In fact, it’s now part of our family’s lore, a la the Chevy Chase vacation movies, when my wife Deb and I played a course and she proudly shot the day’s temperature, 108. (For 18, smart-aleck.) Yes, we love Las Vegas golf especially coming out of the Michigan chill, but we really love the opportunity to go farther afield and experience the great outdoors of Nevada and Arizona and the majestic beauty of the West. 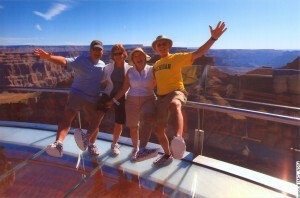 This past fall while in Las Vegas we made a point to knock off a lingering “bucket list” item: visit the Grand Canyon. The first item to consider was how to get there. Based upon internet research and recommendations from some trusted travelers, we opted to take a guided tour out to the West Rim of the Grand Canyon. Suffice to say, it turned out to be an excellent decision, leading to a relaxing, highly informative and entertaining day away from the hustle and bustle of The Strip. 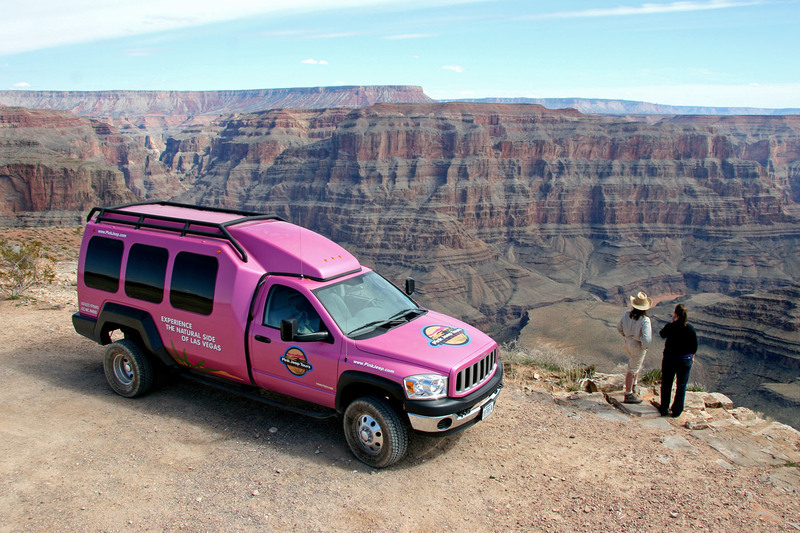 We selected Pink Jeep Tours, an experienced and well-regarded company with a number of tour offerings originating out of Las Vegas. (visit www.pinkjeep.com) As promised, we were picked up at our hotel at 6:45 a.m. and warmly greeted by Dave Deal, our driver and guide for the day. And yes, Deal was driving a Pink Jeep, a custom-designed one-ton, ten passenger Chrysler-made Tour Trekker with large vista windows perfect for our sight-seeing excursion. The vehicle was roomy yet its size lent a more personal feel for our group which included visitors from Germany, Singapore, Japan and Malaysia. En route to the Grand Canyon—which included a restroom and snack stop—Deal was a most knowledgeable guide and storyteller on a variety of subjects. But being seasoned and perceptive, he also knew when not to speak, allowing time for the morning cobwebs to be swept away, the group to warm up to one another, and for the scenery to make its own voiceless comment. Case in point, Deb early on in the trip asked about wildlife in the desert and Deal politely said he would address it later in the morning when the Jeep was in off-road terrain. That he did and it was perfectly timed as we entered deeper into the rugged Mojave Desert. Along the way, we marveled at rock formations and the starkly beautiful landscape, such a contrast to our native Michigan. As we neared the Grand Canyon, Deal also provided our group with a host of common sense tips and reminders on safety and health. “Drink plenty of water, wear a hat, and watch your step,” urged our scoutmaster. “Our tours have a spotless safety record and let’s keep it that way.” And that we did. Our group, despite various levels of trepidation, was exhilarated by the Skywalk experience. For the faint of heart, the designers wisely included a non-transparent path on either side of the clear glass center-lane of the deck which provided mentally a surer footing. We also lucked out by having ideal weather. The air was clear, calm and distinct and the light and temperature were ideal, according to Deal. The views, in short, were heavenly as crows soared above the multi-colored canyon walls and the robin-egg blue sky with only a faint swipe of clouds. After the Skywalk and Eagle Point, our party was taken to the second vantage point on the shuttle tour. Called Guano Point, here more incredible vistas were revealed with the Colorado River snaking its way below. Fitting to its name, we also visited the steel tower and aerial cable tramway that was built in 1958 (and abandoned only two years later) to extricate prized bat guano from a cave on the north side of the canyon. Deal shared good stories surrounding this surprising steel relic that seemed so foreign to this scenic, pristine spot. I liked this one: In 1960, a hot-dogging Air Force jet fighter pilot (pre-Top Gun?) flying low thru this area sliced the tram’s cable spanning the canyon, damaging the plane’s wing, yet managing to get back to base. It wasn’t until 1976 that the main cable was finally removed for such safety reasons. After taking loads of photos and videos, we headed back to the main terminal for final souvenirs and to the cozy confines of the Pink Jeep. Later we would have a filling lunch at a restored “Old West” town. 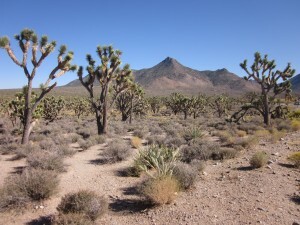 Besides a quick nap, the highlights on the return trip were a photo stop at a glorious section of a Joshua tree forest which uniquely flourishes in the Mojave Desert and later a brief but inspiring stop at the Hoover Dam. Our day ended back at our respective hotels by 5:30 p.m. After a fitting and well-earned ovation for our superb driver and guide, our group said its goodbyes and returned to the now mundane and puny in comparison steel-glass-and-concrete monuments erected on The Strip. Eleven hours earlier, Pink Jeep Tours promised we’d have a memorable day. That we did. And with one less item now on the Bucket List. Great post! I have been to the Grand Canyon and it is truly spectacular. WE camped down at the bottom for a few days. It is definitely an item for anyone’s bucket list who has not yet been there.